There are lots of Markdown editors out there but I couldn't find one in which the viewer was built into the editing pane itself. An example of what I don't want is these SE sites, where the question/answer Markdown preview appears down below. 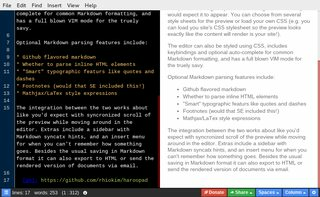 Similarly, the vast majority of existing Markdown editors have two separate side-by-side panes, one for editing and the other for the live preview. This is not what I want. What I want is for the Markdown rendering to occur right where you're typing, replacing the typed text with marked-down text as you go along. Is there anything like this? I'm on Windows but a webapp (or even just raw JS/HTML) would be cool too. Having a similar need to the OP, I searched the whole web for current solutions. There's no current perfect solution, but there are a few ones that might be worth a try. Note that I had additional requirements to inline previewing, such as: multidocuments tabbing, table of contents for quick navigation, lightweight, markup hiding/showing (sourcecode mode) with styling kept and finally autosave of documents and of session. 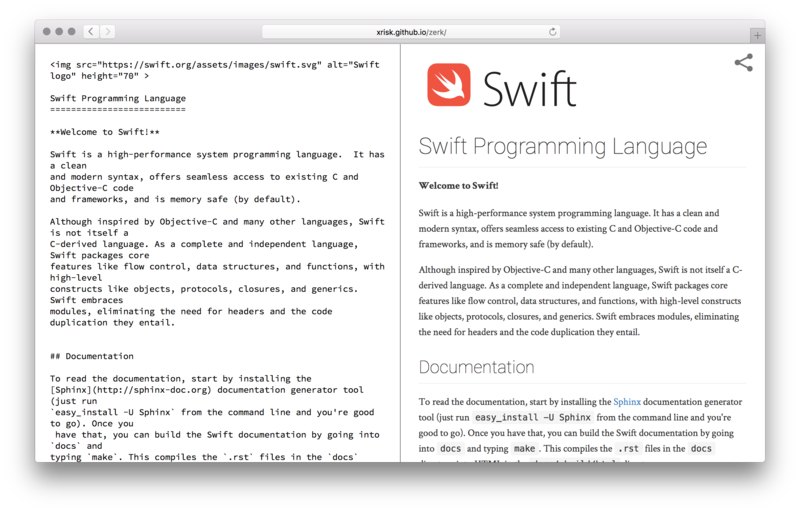 I will here describe two categories of editors that can fit OP's purpose depending on what exact kind of previewing is expected (inline preview vs inline styling). I will describe a few main features non exhaustively, you should consult the websites to get more information. I also chose to leave split-pane only editors (ie, without inline preview nor styling) out of the picture, as there are plenty and are explicitly excluded by OP. Note that I have personally tested all the ones running on Windows. All the following editors allow you to type Markdown markup, and automagically display the resulting style instantly inside the editor (no split-pane for preview). This is also sometimes called WYSIWYG, but this is different here as you do not necessarily have to use the toolbars to format the text: with inline preview you can just input markup code and it will display the result dynamically. In some sense, this is very similar to what LyX pioneered for LaTeX. There are basically two types of inline preview: per block (refresh the styling after you leave a block, eg, by going to the next line/block) or per character (ie, as you type). I am not demonstrating image insertion but they can almost all preview images, both local and remote. Note that almost none of the app here supports multi-document tabs (yet? ), except for the note-taking oriented apps. Both sourcecode and no markup mode are available. No bibliography support (yet?) but can add "link reference" and footnotes. Auto-reload notification when document changes. 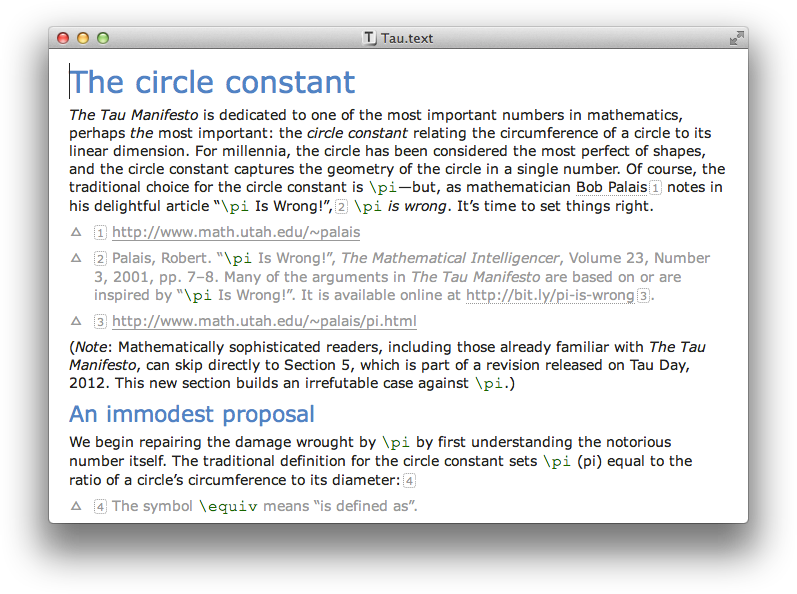 Live preview as-you-type of mathematical equations. Note: this is a very interesting solution if you do not just want to write notes but also manage files. 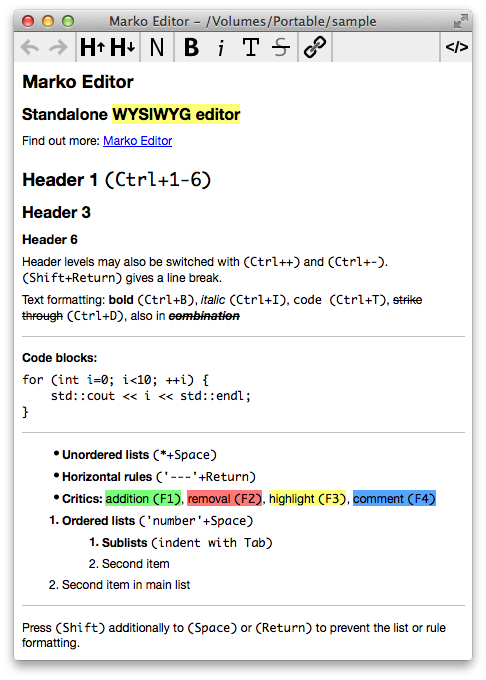 TOASTUI.editor, a new kid in the block, WYSIWYG editor with CommonMark and GithubFlavoredMarkdown support, and also copy-paste from external spreadsheets and images. If you are a JS developer, feel free to help! 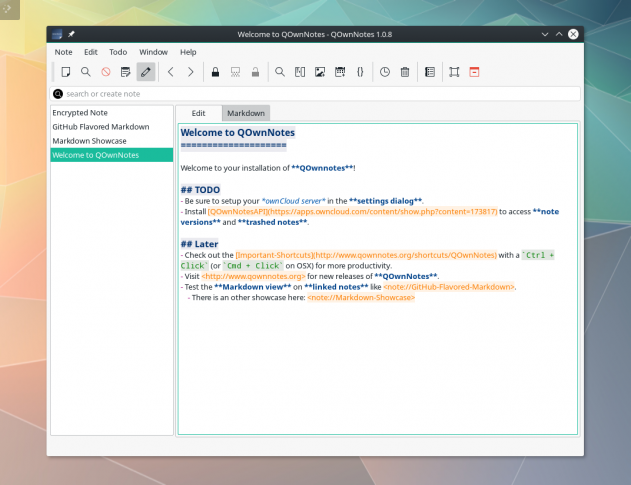 Simditor with Markdown extension (or this one). Personal note: this app seems goddamn amazing, but it is not yet available unluckily! Please reach the author if you are interested too! Disclaimer: the following review is a bit biased as I am regularly using this software. 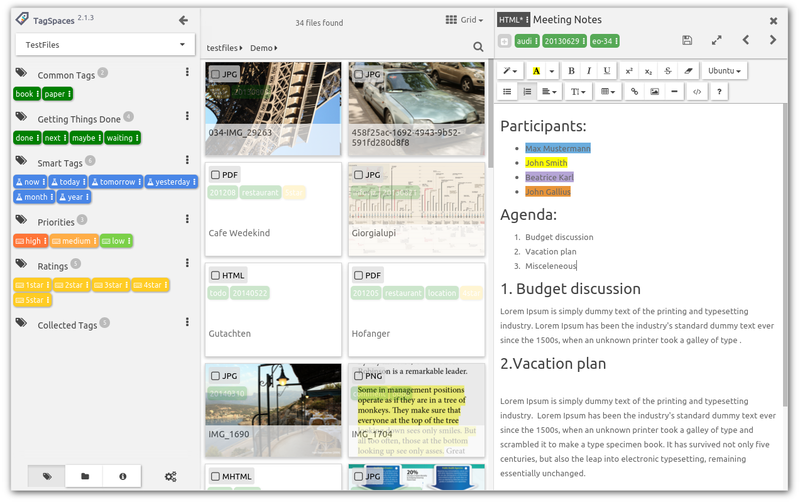 Tags, pictures, can attach files alongside notes, calendar, etc. No Markdown support for storing the files (can only import/export to Markdown, but otherwise the notes are stored as Zim markup language). /UPDATE: to get instant refresh for all markups (like bold, italic, etc. ), you need to enable the option "Reformat wiki markup on the fly" in the Editing panel of Preferences. 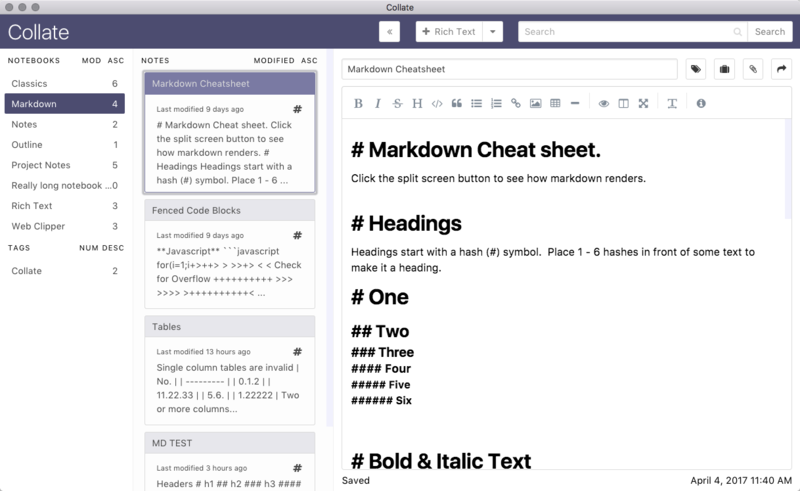 Collate (aka CollateNotes) is a note manager with an integrated Markdown editor mixed with YAML to store metadata. It has live rendering and editing abilities. Everything is stored on local computer. Made with crossplatform compatibility as a requirement (Windows, Mac, Linux). Supports syntax highlighting for most languages. Commercial software, free trial for 14 days. The following editors won't provide a full Markdown inline preview, but they provide a prototype formatting/styling of your document. This allows you to somewhat know what your document will look like, even if some elements may not be correctly styled (or previewed at all like images). They also all provide a split-pane or a separated window for a full preview. Note: inline styling is NOT just a simple regex in a code editor (such as Notepad++, SublimeText, Atom, etc. ), because they cannot differenciate between different markup depths (eg, all headers levels are shown with the same styling), hence, they are excluded here. Note: seems to be unmaintained since a few years now (the official website is dead, only the github remains). It displays a live view on the right side. You can see a full list of features on the website. When starting MarkdownPad for the first time, it asks whether you want to buy the Pro version or use the free one. You can just click on "Use free" and it will never ask you again. I'm using ReText for that. It's written in Python, so it should be cross-platform; in the project Wiki you can find detailed instructions on how to install ReText on Windows, as that's the platform you're using. ReText does a great job for me on Linux. Supports a lot of "specific dialects" in addition to standard Markdown, like Michel Fortins Markdown Extra, MathJax, and many more. You can export your texts as HTML, ODT (Open Document Text, i.e. for OpenOffice/LibreOffice), PDF. I'm using this for a while now, and it's running stable, smooth, and fast. With support for mentioned "dialects" (I'm pretty sure I saw somewhere it also support the dialects in use here at SE, and the one from GitHub), I can only heartly recommend it to you! Works offline - documents are saved in your browser's local storage, and can be opened from and saved to your local filesystem. Once loaded, the app's code is cached by your browser, and will open and work just fine with zero Internet connectivity. Support for publishing a document to Blogger, Dropbox, Gist, GitHub, Google Drive, Tumblr, WordPress or any SSH server. Not that while this does offer a live, synchronized preview rendering, and attempts to style the source based on the markup being edited, it does not allow editing of the preview itself - whether or not the styled editor is sufficient for your requirements I cannot say. Another alternative you can choose is Github Atom. The example I show to you is some dummy texts on Markdown. 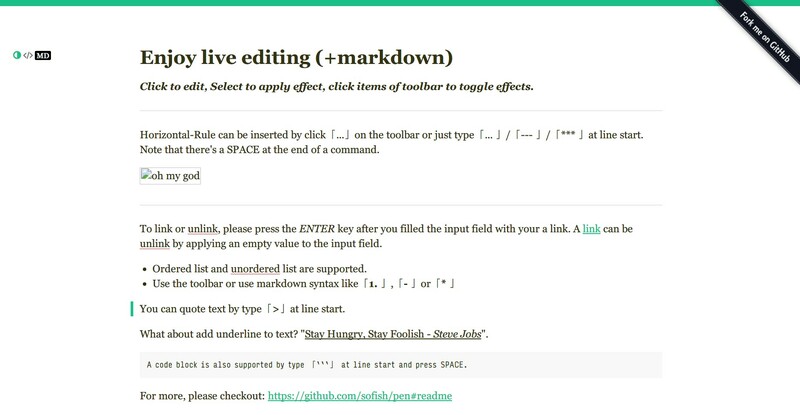 The way you can get it is very simple: write your Markdown text and press Ctrl + Shift + M, then another pane will show the result even your live editing. Github Atom is free and open source, available for Windows. You can download it here by downloading the executable file one. Feel free to ask if you have something to say. I very strongly suspect there aren't any editors specifically like that. (edit: I stand corrected @Izzy) However with a bit of plugin and external software installation you can have SublimeText do that. (You can try to step 5 without this from the normal cmd line and it may work depending on your installed tools/path) Install Windows SDK 7.1 . It'll work on any thing XP+. Windows SDK 8 won't work - doesn't include all the tools so you have to install that and a compiler. If you have the VS 2010 redistributables installed already try unchecking them in the installer for the Windows SDK - otherwise, you may have to uninstall them to be able to install this and then reinstall the newer version if you need to at some point. Install Node.JS package Markmon - best to just type in a the Windows SDK Build Environment cmd prompt npm install -g markmon. 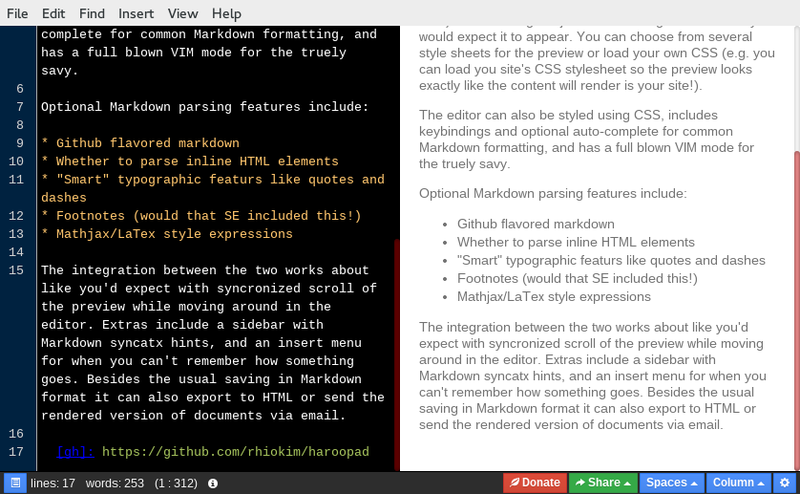 Rendered markdown will appear live as you edit it in SublimeText in a new browser window. You can position them side by side to make it work pretty good. 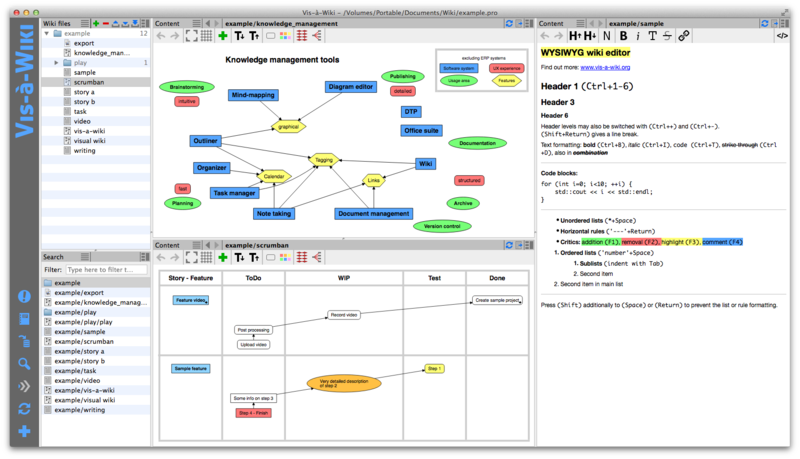 Haroopad is a cross-platform (Linux, OSX, Windows) Markdown editor GUI based on NodeJS that includes a live preview pane. In a lot of ways, it is similar to the Atom editor (in fact I suspect they share some node libraries) but the interface is tailored specifically for dealing with Markdown documents. The preview pane updates in nearly real time (although I don't think it's quite as responsive as some others I've tried) and does a good job of rendering Markdown as you would expect it to appear. You can choose from several style sheets for the preview or load your own CSS (e.g. you can load you site's CSS stylesheet so the preview looks exactly like the content will render is your site!). The editor can also be styled using CSS, includes keybindings and optional auto-complete for common Markdown formatting, and has a full blown VIM mode for the truly savvy. The integration between the two works about like you'd expect with synchronized scroll of the preview while moving around in the editor. 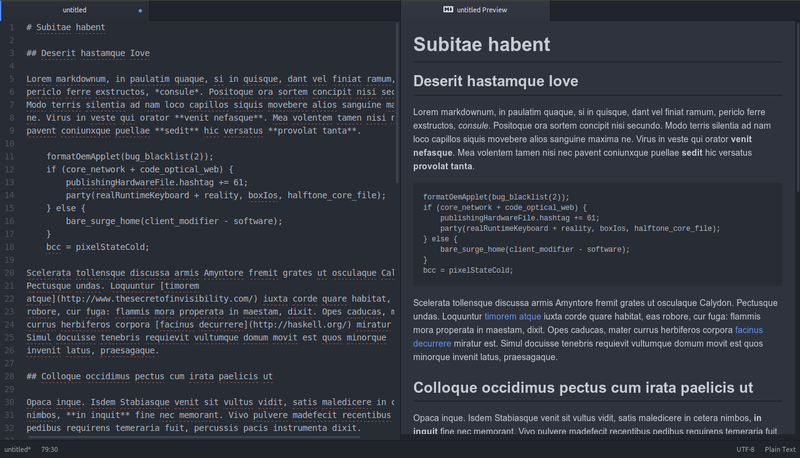 Extras include a sidebar with Markdown syntax hints and an insert menu for when you can't remember how something goes. Besides the usual saving in Markdown format, it can also export to HTML or send the rendered version of documents via email. I've been asking this question for a long time now too. I use this: Pen -- what you see is what you get. It's probably not as full-featured as other solutions, but I really appreciate that I can style in the same window. Hope this helps. NOTE: It's a little buggy, not sure if it would fit your needs. But I do have to point out, it has potential. 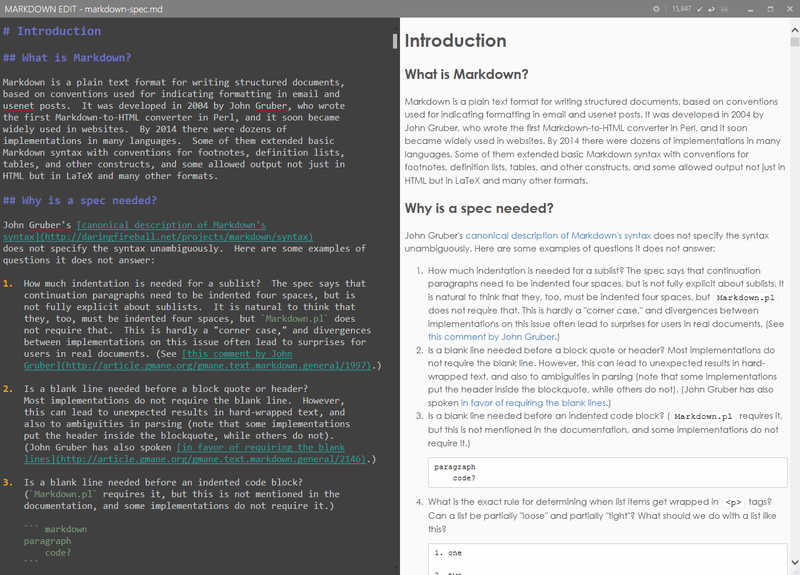 Here's a new Markdown Editor for Windows to check out. 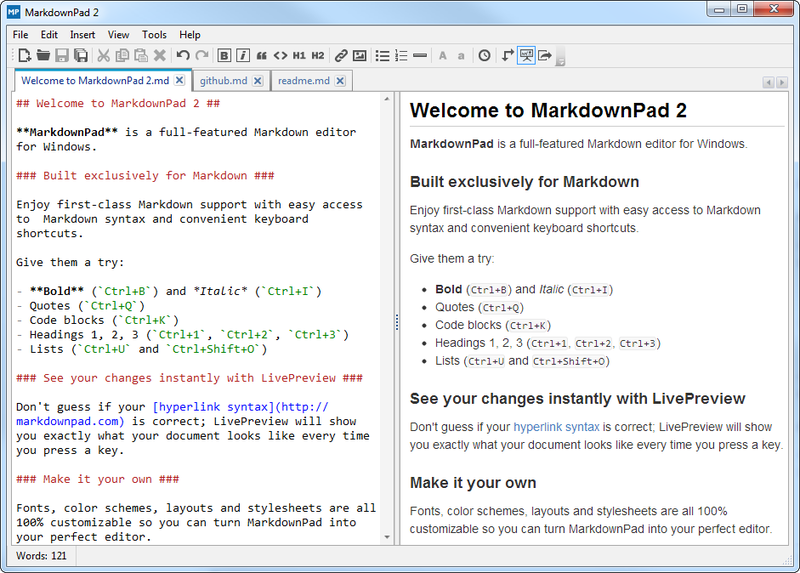 Markdown Edit places the emphasis on content and keyboard shortcuts. Menus and status bars are minimal and subtle. Markdown Notes would fit your needs. There is a live demo on the front page if you want to use it just as an editor. 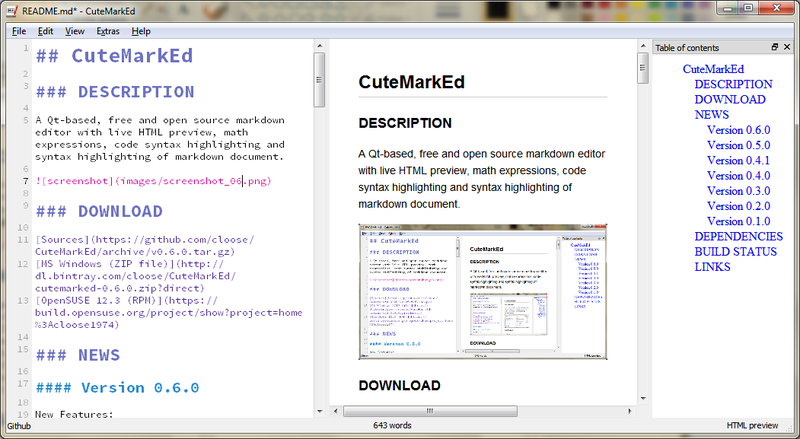 There are also some features such as image uploads and LaTeX support that are not available in every markdown editor. May I recommend Zerk.tk? It's extremely simple to use with just an editor and a viewer, nothing else. It has one export feature that exports directly to GitHub Gists. It's a web app but you could clone the repo to download it for offline use. A simple markdown REPL, nothing more. Fully in-browser with zero server-side processing. It's strange but there is no answer about great, free and open-source Visual Studio Code. VS Code supports highlighting, live preview, header folding, and other Markdown features (see an official description). 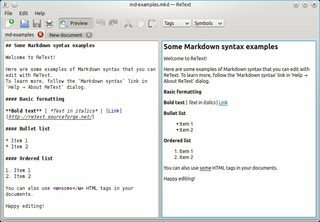 Moreover, there are plenty of markdown plugins that improve productivity: Code Spell Checker, MarkdownLint, Table Formatter, Markdown TOC and other. 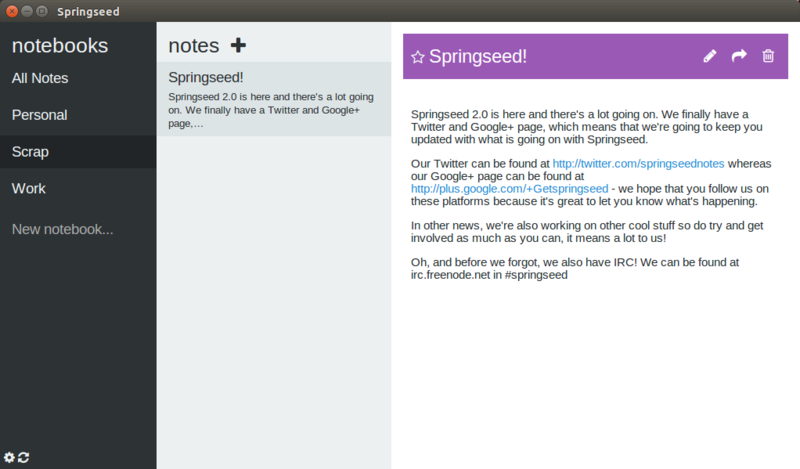 StackEdit actually has an offline Chrome app as well, meaning it can be used as a cross platform Markdown editor. It's built on the same stuff as Stack Exchange, so the experience is similar to that. 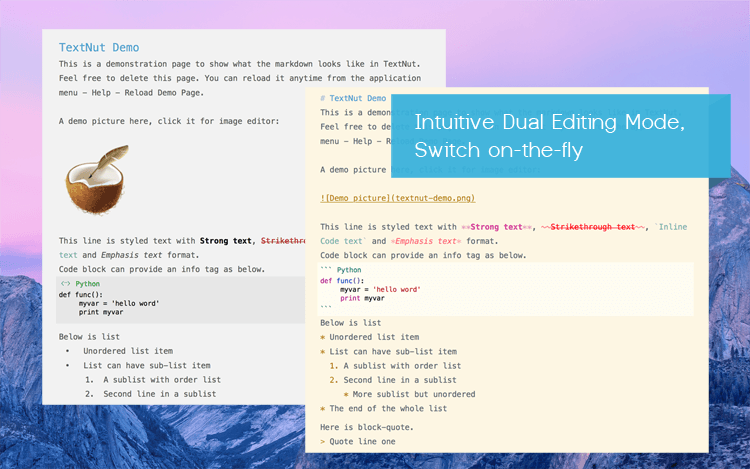 If you're looking for something that integrates the Markdown output in the same pane, I'd look at Qute, which is a Markdown editor for Windows/Mac that lets you edit individual paragraphs as Markdown then switches them back to preview. 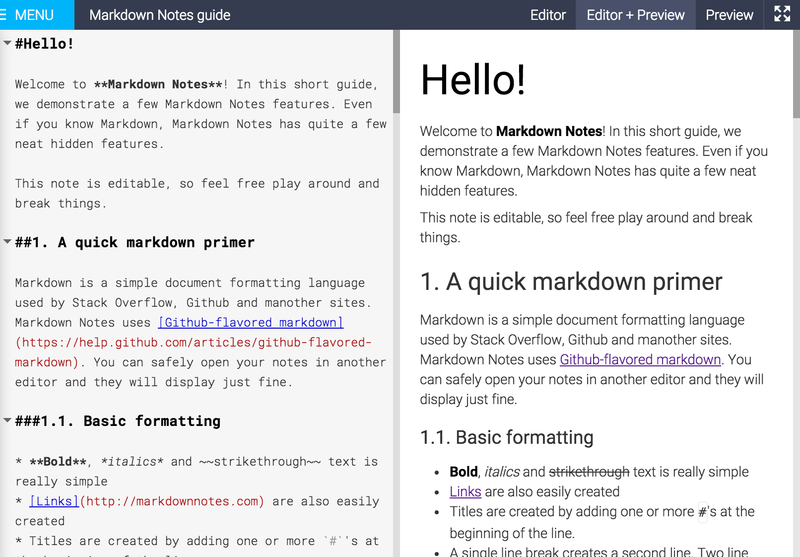 There's also a List of 78 Markdown editors that might have what you're looking for. 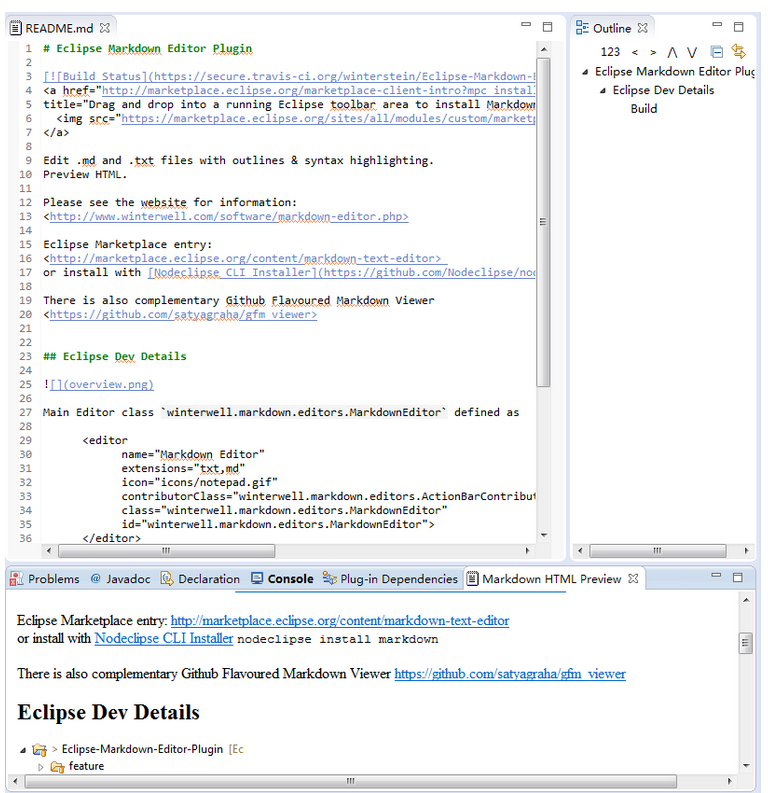 Microsoft Visual Studio has a plugin Web Essentials that provides markdown syntax highlighting and preview. It's a good choice if you're going to be slinging code along with your markdown. On Windows 10 there is another alternative which is BookPad, you can find it in the Store. 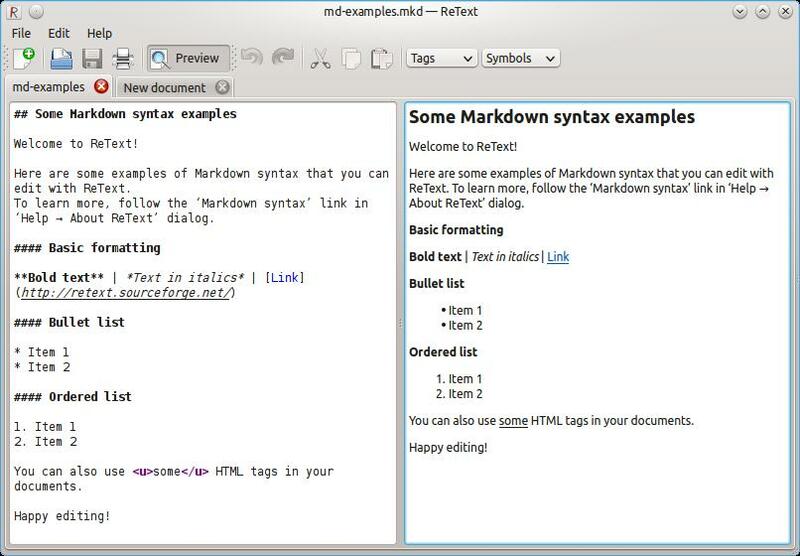 It is an offline markdown editor but supports a lot of the extra syntax. The out put is beautiful. Not the answer you're looking for? Browse other questions tagged windows text-editors markdown or ask your own question. 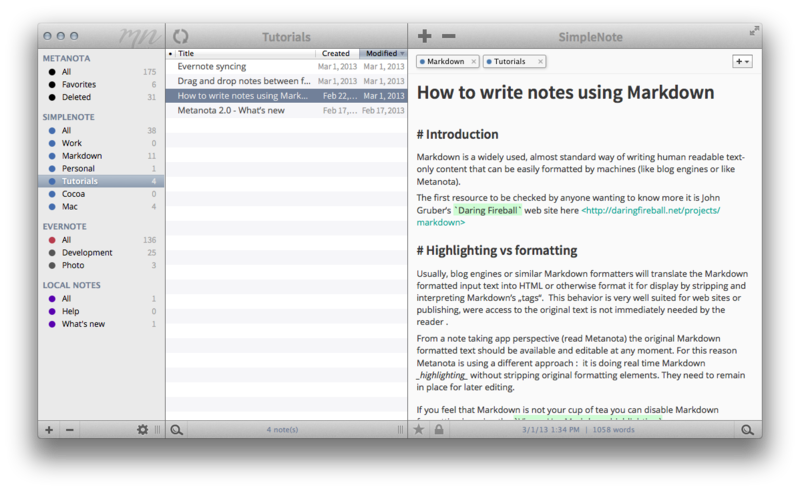 Markdown editor for OSX that includes a preview, ideally in real time? A good editor for technical tutorials on Mac? Recommend me a webapp that allows paste from clipboard to a web page/web app/window where the clipboard is converted to whatsapp text formatting?